In 2008 I spend three months backpacking around Southeast Asia. This is one of my stories. Keli and I took turns riding the broken bike the whole winding road back. We’d spent our second day cycling around the island of Don Khong and across to a neighbouring island to see the Khone Phapheng Falls, the largest waterfall (by volume) in Southeast Asia. 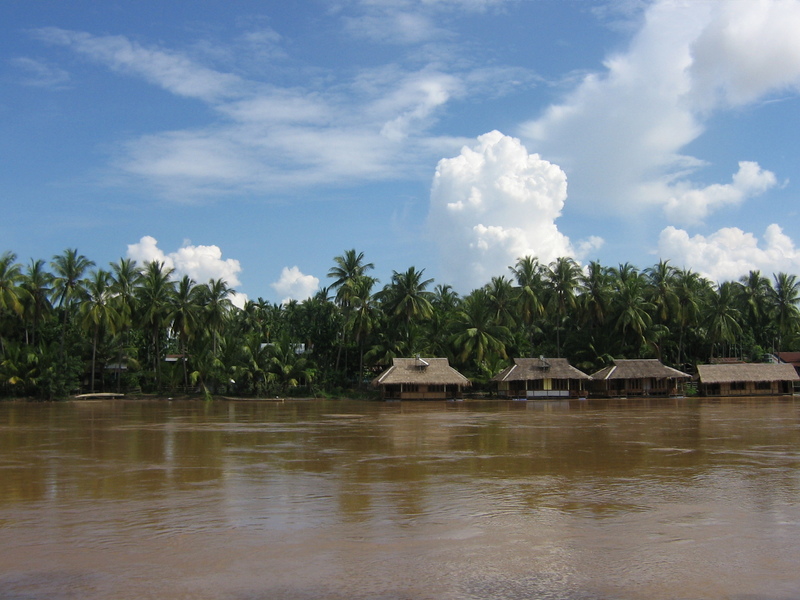 4,000 Islands or Si Phan Don are nestled into the verrrry bottom of Laos right near the Cambodian border. Though often frequented by young backpackers as a side trip from Thailand, Laos shares much less in common with its neighbour to the southwest than you might think. In 2008, at least, there were no 7-11s, no t-shirts boasting Heidi Klum’s naked back and middle finger (a Khao San favourite in those days), and at least 75% fewer buckets* per person. 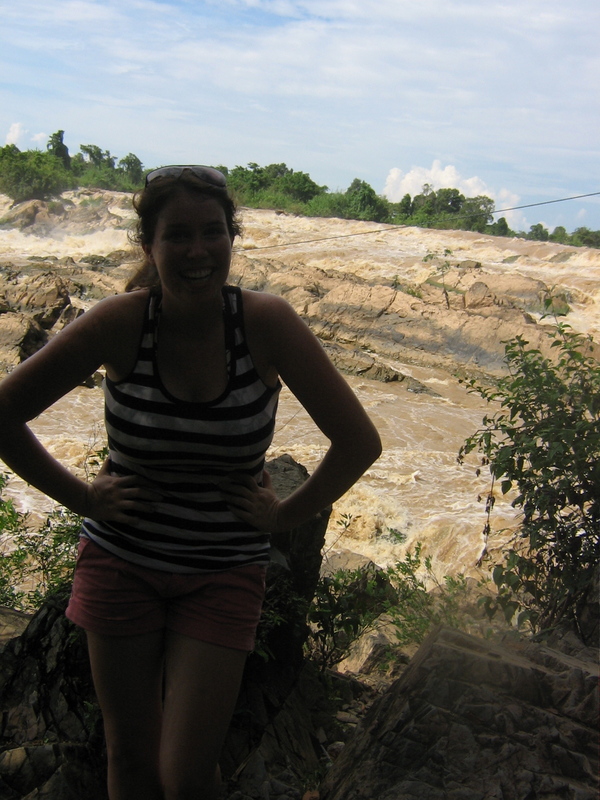 Striking a pose in front of Khone Phapheng Falls. I had met my travel buddies, Katie and Keli, British ladies on their way back from a year in Australia, on the bus from Chiang Mai to Chiang Khong. That was where we would start our two-day slowboat journey down the Mekong River and into the heart of Laos. After 10 days traveling through peaceful Luang Prabang, dionysiac Vang Vieng, and sleepy Vientenne, we decided to set off for the 4,000 islands together. Kelly, Keli and Katie. We bid adieu our other Laos travel companions — they were headed off to Vietnam — and went south. We landed our first night on the island of Don Det. But, with no other backpackers to be found, decided to head over to Don Khong as soon as possible for what we hoped would be a livelier time. First thing the next morning we loaded all our worldly possessions into a large canoe-type boat with a motor on the end and set off, the water around us murky brown, like the colour of milk chocolate gone rancid. Our boat floated lazily downriver, guided slowly by the puttering motor, passing linked islands, their foliage spilling out into the water. The world here is flat, nothing but palm trees separate island and sky. Guesthouses pepper the shore, raised up on stilts. Some of them have brown, thatched roofs; others red or blue plastic tiles to protect them from the elements. Most have hammocks swinging on their balconies. 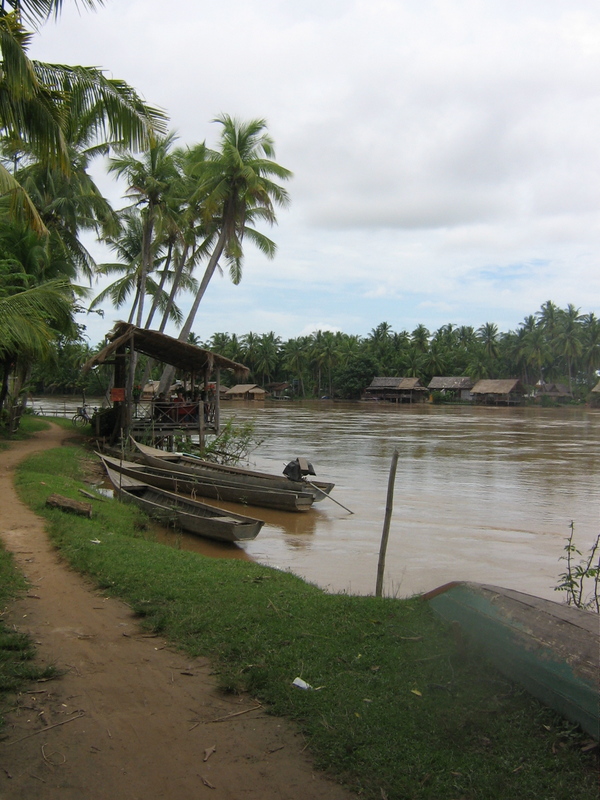 After arriving on Don Khong, we spent the better part of an hour searching for a place to sleep. All the huts were dingy and beat up. I would safely say there wasn’t an air conditioning unit around for miles. We didn’t come across many backpackers either, so we decided to spend only one more night there and leave for Cambodia first thing in the morning. By this logic, we were satisfied with a small room, boasting one double bed (to squeeze the three of us in), a couple stringy hammocks on the balcony, and the not unfamiliar combo of hole in floor + sink = bathroom. If memory serves, this particular hole was surrounded by shiny blue tile; a classy touch. After arranging for early morning transportation off the island and over the border, we rented some bikes and began to explore. After taking pictures at the waterfall, we had hoped to rent a boat and be taken to see the Irrawaddy dolphins, (a breed that lives in brackish or freshwater), but our leisurely pace had set us behind. Twilight was creeping nearer, and the boat drivers wouldn’t take anyone out this close to dark. So we turned back around and bike through the palm trees and past the vibrant green fields back to our guesthouse. Katie’s chain fell off her bike about fifteen minutes into our return journey. Our bike path on Don Khong. My hands got all greased up trying to repair Katie’s chain. Locals we passed on the way tried to help as well, but the chain was broken; there was no fix. We decided to take turns on the broken bike, one foot on a pedal, the other foot pushing and coasting, pushing and coasting. Although we didn’t have enough light to make it to see the dolphins, we should have had plenty of light to get home before dark. But a sign poking out of a window just off the road reading ‘Authentic Italian Pizza’ distracted us from our journey. We couldn’t resist stopping. A margherita and two quattro formaggis later, the sun had set and we were on our way again, now in the pitch black dark. It seems to be pizza > safety, every time. Fortunately, between the three of us we miraculously had two items that glowed. 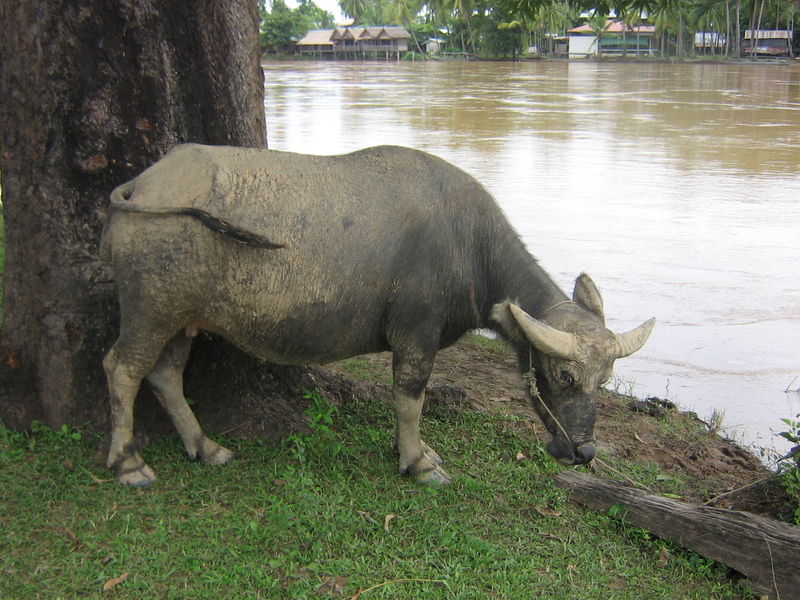 Unfortunately, that didn’t stop Katie from almost biking head on into a water buffalo. At least none of us fell into a rice field (though it got uncomfortably close). It was about nine thirty at night by the time we road in, elated and exhausted. We laid our bikes up against the shop we’d borrowed them from and surveyed the near deserted pathway. Lights glowed from only a few buildings. We wandered down until we found the island’s internet cafe. Settling in, they reminded us of the electricity curfew of the entire island. Lights off at ten o’clock. (Yes, the entire island, believe it or not, turns off at 10 p.m.) We spent 10 minutes checking Facebook, then, realizing the time, headed to a little shop nearby to buy candles. It was now quarter to ten, just enough time to return to a our wee little room, brush our teeth, and tuck ourselves in before the entire island went dark. Four legs angled to jut out of its front half and another four jutting out the back. Not round, but rectangle shaped; gigantic; hairy; brown; spider. I repeat, inside our mosquito net. And yes, with ten minutes until the whole island was to go dark. I’ve always been afraid of spiders, my whole life. And, apparently, so have Keli and Katie. We screamed, I am not proud to say; then we stared: at each other, at the spider, our mouths gaping open and closed, silently, in utter shock. This is no good. I watch as tears roll down Katie’s cheeks and I try to gather enough breath in my lungs to stop my hands from shaking violently. This response is not rational, I know. But today does not appear to be the day that any of us conquer an irrational phobia. So what are we going to do? We’ll sleep on the balcony. That’s the only option. But it’s not an option. Our bags are on the floor, we can’t leave them there, open, unattended. There are only two hammocks on the balcony and they’re scrawny as hell. And God only knows what could crawl on us out there. Someone needs to get rid of the spider. It has to go. We need to sleep in that bed. But I won’t move it. Keli won’t move it. Katie won’t move it. Fine, we won’t sleep. We’ll stay up all night, smoking our dollar packs of cigarettes, swinging on the rickety plastic hammocks. No. No. We’ll go get help. There’s got to be someone who can help us. I instruct Keli to stay put and watch the furry monstrosity. Don’t let your eyes stray from it, or it could move and then where will we be? Stare at it. Don’t even blink. Katie and I grasp on to each other, still shaking, and head for the road, back to the cafe. We spot an older couple chatting with a guy in his late twenties. Excuse us. Is there… Could you… could you possibly do us a huge favour? They initially regard us with concern (it was probably the tears) but after we explain the situation, they simply laugh. We guide them back; the young man has agreed to remove it for us and the couple wants to watch. Keli is still standing at the entrance of our room, petrified. There, we point… inside the mosquito net. The young man looks inside the room. The three of us edge backwards. The older couple giggles at our state. The man pulls a tissue out of his pocket and steps inside. My eyes burn as I try to remain calm. We’re too far back on the balcony now to see what’s going on. He’s in the room just a second, but by the time he comes out, we’ve crammed ourselves into the furthest possible edge of the balcony corner. Got it. He stretches his arm, and spider-encased hand, out toward us, teasing, but is met with shrieks high enough to communicate with stray dogs on the other side of the island before he can even fully straighten out his elbow. Seeing our fear, he rescinds the gesture. Thank you. Thank you. We couldn’t have… Oh my God, thank you so much. We have about two minutes ’til lights out now. The emanate terror is gone, but every dark corner holds a new, unknown threat. I pick gingerly through my bag, poised to react at a moments notice, and pull out a long sleeve t-shirt and pants — clothes inappropriately warm and packed mostly for plane rides — but I need to cover as much skin as possible. I pee into the blue tiled hole, eyes peeled on every corner of the room. I brush my teeth and slip into bed next to Katie, who under the pretence of being the most frightened managed to score the middle spot. Keli’s laid out candles on the window sill and I watch them burn as we tuck in every corner of the mosquito net, our sole protection from the outside world and all its creatures. Katie plays music from a small speaker. We speak in hushed tones, as if loud noises might stir other figments of our nightmares. I lay awake, watching the candles melt, drip, and, slowly, go out. The next morning, after a sleep even more fitful than one an overnight bus blasting The Beach on repeat, we pack our bags and head to the boat. As we settle in to the passenger van that will take us to Kratie, Cambodia, my long Canadian legs squished against the back of the driver’s seat, we talk about our plans to stay the night somewhere, not only air conditioned, but in a building, made of cement, on the top floor. The mini bus revs on and we begin our journey across another boarder, happy to be leaving Laos. Little do we know, the first thing to greet us on the other side will be a platter of barbecued tarantulas resting atop a smiling Cambodian woman’s head. Maybe it’s time to conquer that fear after all? * bucket – a mixture of Sang Som (Thai whiskey), coca-cola, and red bull (the illegal in North America kind) served in a colourful plastic bucket (think children’s sand pail) with many straws meant for sharing (or not) and causing its imbibers to get incredibly fucked up. Every Tuesday I’ll be doing a new Travelback instalment. It’ll will likely be different every week — sometimes a list, sometimes an essay, sometimes just highlights or photos. A huge dream of mine is to write about travel and the world… Okay, well, I’m already living that dream, so I should specify: a huge dream of mine is to get paid to write about such things. This exercise may be a bit self-indulgent, but ultimately I want to work my travel writing muscle to the point that it’s strong enough to entertain and inspire you. As such, I hope you enjoy. xo Kelly.